Does you skin often look dull, shiny or your makeup patchy and uneven? That’s because it has a buildup of dead skin cells, blocked pores, and remnants of old makeup. No matter how well you think your removing your makeup each night, not even the best cleansers and toners will get down and dirty to remove every last trace of your makeup, and that’s why it is très-important to use a daily exfoliant. Where do I begin you are probably thinking? But as always I have tried and tested a few products to help you on your way. 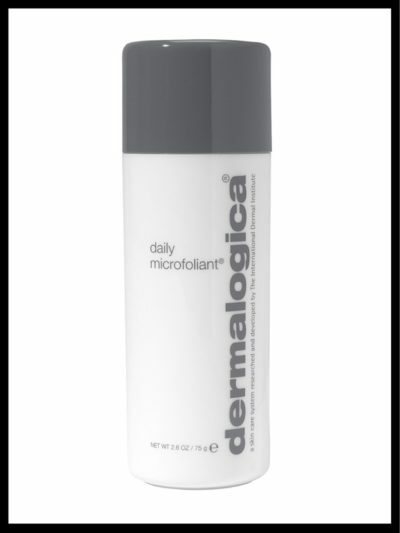 First up is Dermalogica’s Daily Microfoliant. Being one of the worlds leading and well known face brands I was expecting big things from this. Coming in its classic white and grey packaging, it’s powder to paste formula is a little bit messy at first to work with. It activates upon contact with water releasing Papain, Salicylic Acid and Rice enzymes that micro-exfoliate dead cells. Claiming to instantly leave skin smoother and brighter. Once I had used a pea sized amount mixed with water to make a creamy paste, I began spreading it across my face in circular motions and began to feel like my skin was actually burning. It started to go quite red and felt very irritated. I had to rinse the product off immediately. Instructing to massage the product for one minute before rinsing thoroughly the irritation and discomfort was just too much. I don’t recommend this if you have super sensitive skin as it is only too harsh and irritable. Retailing from £28 you are better spending your money on something else. 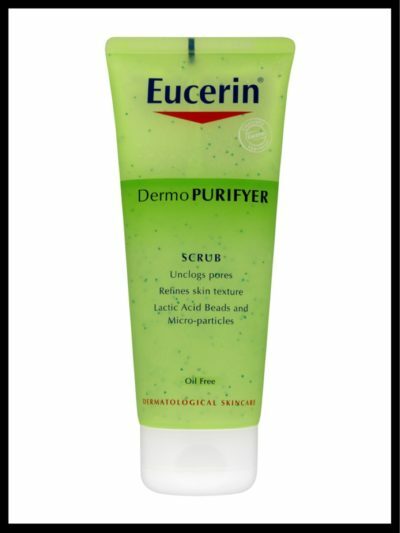 Leaving my face to recover for a day or so I then tried the DermoPurifyer Scrub by Eucerin. This particularly targets oily and blemish-prone skin and unclogs pores and refines skin texture. Pore-refining micro-particles containing Lactic Acid gently exfoliate the skin without damaging it and work directly where blemishes originate without drying the skin. Using this facial scrub was a lot easier than the Dermalogica one. You just have to squeeze out a little pea sized amount and apply directly to your face without the need to mix it. After using it on my face for around a minute I rinsed gently and pat dried my skin and it instantly felt so refreshed. It was not tingling or burning and my skin felt so smooth. My primer and makeup glided on and my face had no shine at all. The product itself removes excess sebum which is what makes your skin oily. There was no residue left behind and was not a harsh scrub by any means. After using for a few days I did notice that any blackheads around my chin and nose area where starting to lessen and my skin was looking a lot brighter and my rosacea has calmed down a lot. Available from most large Boots and chemists from £6.85. 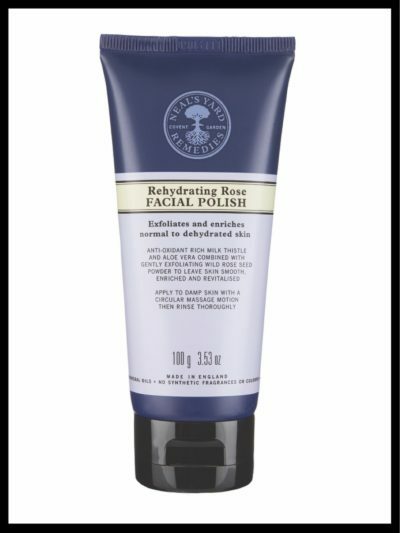 The final facial scrub I tried was Neal’s Yard Rehydrating Rose Facial Polish. Revitalising, gently exfoliating and enriching normal skin types with antioxidant rich milk thistle, cooling aloe vera and exfoliating wild rose seed powder, this weekly treatment removes everyday impurities and dead skin cells to leave you with a smoother complexion. It did state it was for normal skin types but I wanted to give it a whirl myself even though I do have sensitive-oily skin. The scent of this product is absolutely divine, surprisingly even being fragranced it did not irritate my skin at all. My skin tone looked more evened out afterwards, the dull grey appearance was definitely gone and just like the Eucerin it left my skin glowing and very smooth. My skin really did feel refreshed and radiant afterwards and was just the pick me up I needed after a restless night. Available online from Neal’s Yard or John Lewis, £16. This is a weekly treatment and one I will continue to use alongside my daily use of Eucerin. After 8 weeks now of using the both I have definitely seen an improvement on my skin tone, less shine, skin is smoother and brighter and feeling like its very hydrated. 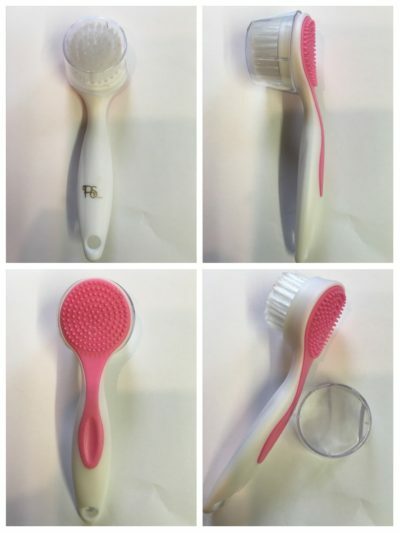 You can use all the products just by massaging in with your fingers but I picked up this handy facial brush for £1 from Primark and I am really impressed with it. It even comes with a travel lid and massage head on the back of the brush. 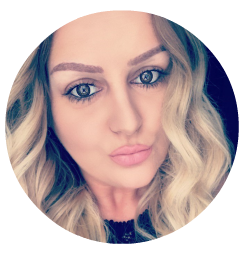 It feels like you are really working the product into your skin well and removing all the dead skin cells and opening your pores. Just make sure you avoid the delicate eye area with all facial scrubs and brushes and rinse well with cold water afterwards to close up those pores followed by your usual daily moisturiser. Don’t forget to continue to keep your skin hydrated, nothing beats the good old fashioned H2O. 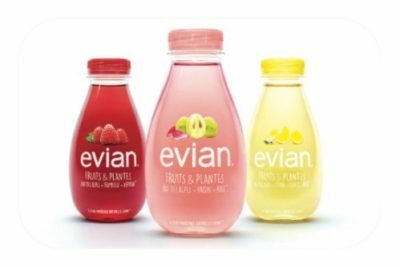 If you struggle to drink normal water why not try infusing it with fruit the night before or check out Evians new fruit and plant infused water range. With Grape & Rose, Lemon & Elderflower and Raspberry & Verbena to choose from, there will be something to quench everyone’s taste buds not to mention the pretty packaging.